University of Illinois Press, 9780252080944, 152pp. "The river was in God's hands, the cows in ours." So passed the days on Indian Farm, a dairy operation on 700 acres of rich Illinois bottomland. 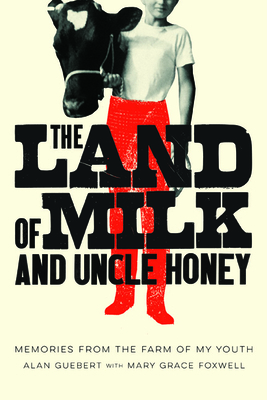 In this collection, Alan Guebert and his daughter-editor Mary Grace Foxwell recall Guebert's years on the land working as part of that all-consuming collaborative effort known as the family farm. Here are Guebert's tireless parents, measuring the year not in months but in seasons for sewing, haying, and doing the books; Jackie the farmhand, needing ninety minutes to do sixty minutes' work and cussing the entire time; Hoard the dairyman, sore fingers wrapped in electrician's tape, sharing wine and the prettiest Christmas tree ever; and the unflappable Uncle Honey, spreading mayhem via mistreated machinery, flipped wagons, and the careless union of diesel fuel and fire. Guebert's heartfelt and humorous reminiscences depict the hard labor and simple pleasures to be found in ennobling work, and show that in life, as in farming, Uncle Honey had it right with his succinct philosophy for overcoming adversity: "the secret's not to stop." Alan Guebert has written the nationally syndicated column "The Farm and Food File" since 1993. His awards include Writer of the Year and Master Writer from the American Agricultural Editors' Association. Alan and his wife, the lovely Catherine, live in rural Delavan, Illinois. He can be found on the Web at www.farmandfoodfile.com. Mary Grace Foxwell graduated from Saint Mary's College in 2007. She and her husband Andrew co-direct the social media advisory firm Foxwell Digital in Madison, Wisconsin. Gracie may be reached at www.foxwelldigital.com." "Alan Guebert is the rare writer who eloquently combines his personal story and journey with where agriculture is headed. With humor and honesty Guebert tells like it is--and gives his readers the tools to fight for a food and agriculture system that is fair for farmers and workers and safe and healthy for eaters. I recommend this book to anyone who wants to hear the story of food from someone who has been following it for the last three decades." "As authentic, honest, accurate portrayal of farm life on an American dairy farm in the last half of the twentieth century as you can find anywhere."